Maze is knit out of 6-ply hemp. Hemp is a fiber for our busy lives. It won't wrinkle, rot, or mildew and it's machine washable and dryable. Hemp's knitting properties are like linen; it softens with wear and washing, but when knit has very little elasticity. 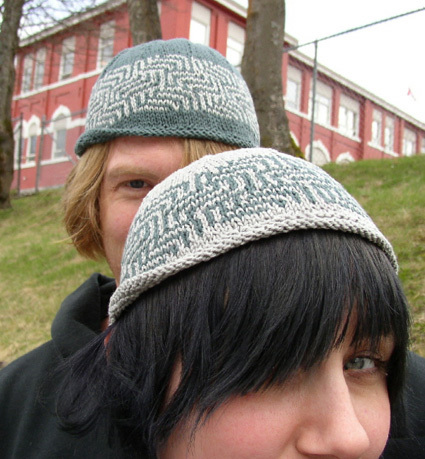 The Maze is knit in the round starting with a narrow roll rim leading into a modified maze slip-stitch pattern and ending with a rounded crown. I have taken the original maze slip-stitch pattern that can be found in Barbara G. Walker's The Second Treasury of Knitting Patterns and removed the repeat row. The maze pattern pops out due to the contrast in colors. As a knitter I have admired Barbara G. Walker for several decades, and now as a knitwear designer I am in awe. 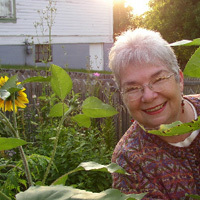 She published seven knitting classics from 1968 to 1976. The stitch patterns that are found in the four volumes of her Treasury of Knitting Patterns have become universal. She evolved slip-stitch knitting into mosaic knitting, and at the same time turned how we knit 'upside down' with the publication of Knitting from the Top. What a productive 8 years. She has since moved on to become a medieval scholar and a renowned feminist. So hats off to you, Barbara G. Walker! Note: By reversing the colors, 1 skein of each color is enough yarn for two hats. Longer version shown below in Charcoal [MC] and Aubergine [CC]. Main pattern is for shorter version of hat, with notes on making the longer version included. When you see an asterisk (*), this indicates a point where directions are different for the longer version. While knitting, the hat will curl and the maze pattern will pull in. After blocking, the bottom band will lie flat and the maze-patterned portion will relax. Please use markers to help keep track of pattern repeats. Directions for the Long Tail Cast On method can be found here. When working this mosaic pattern, you will alternate colors every round. You will only be using one strand of yarn at a time. 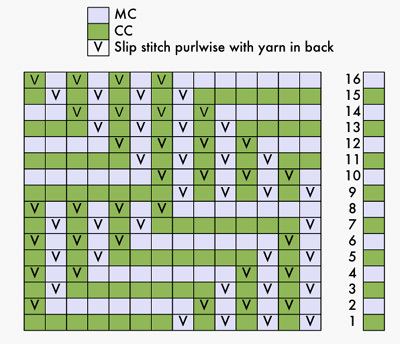 For each pattern row, the stitches in the chart that are in the working color for that row are knit, those in the opposite color (marked with a "V") are slipped purlwise. When reading the chart, the bar at right shows which color is used for each row. All chart rows are read from right to left. Always hold the yarn to the back of the work when slipping stitches. When beginning a new round, bring the new color up from under the old color, so that the yarns will twist around each other. This will prevent small holes from forming at the ends of the rounds. With MC and smaller circular needle, CO 106 sts using Long Tail Cast On method. Place marker (use marker which is different from other markers) and join to begin working in the round, being careful not to twist. Increase Round: [K4, kfb] 20 times, k6. 126 sts. Using larger needle, k 2 rounds. Hat will be worked with larger needle from this point. Chart Round 1: Join CC, [work 14 sts of Chart, place marker] 8 times, work 14 sts of Chart once more. The markers will help you keep track of the charted pattern repeats. Work Rounds 2-16 of Chart. *Work Rounds 1-8 of Chart once more. Note: Change to double-point needles when necessary. Pull yarn tightly after working each decrease. Round 1: [K12, k2tog] to end. 117 sts. Even-numbered Rounds 2-20: K all sts. Round 3: [K11, k2tog] to end. 108 sts. Round 5: [K10, k2tog] to end. 99 sts. Round 7: [K9, k2tog] to end. 90 sts. Round 9: [K8, k2tog] to end. 81 sts. Round 11: [K7, k2tog] to end. 72 sts. Round 13: [K6, k2tog] to end. 63 sts. Round 15: [K5, k2tog] to end. 54 sts. Round 17: [K4, k2tog] to end. 45 sts. Round 19: [K3, k2tog] to end. 36 sts. Round 21: [K2, k2tog] to end. 27 sts. Round 22: [K1, k2tog] to end. 18 sts. Round 23: [K2tog] to end, removing markers. 9 sts. Break yarn, leaving an 8-inch tail. Draw tail through remaining sts and pull tight. Machine wash in cold water and lay flat to dry, pulling into shape; or steam press, if preferred. Roll the back of the lower band over the purled ridge once, and leave the front of the band unrolled for an interesting style. 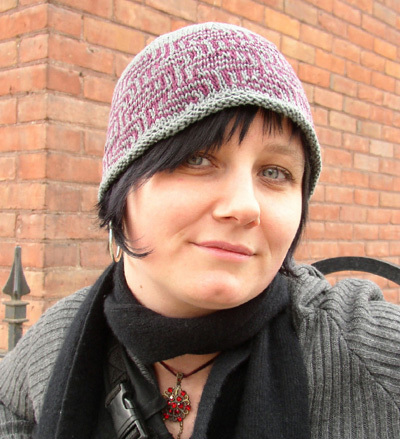 Celeste Culpepper has been knitting for decades and lives in Nelson, BC. To see more of her designs in hemp, visit www.hempforknitting.com and look for the Lacy Little Top and the Leaf Lace Skirt.